The Hunter Houle Memorial Foundation is gearing up for another eventful day of fun, friendly competition and enjoying life the way Hunter always did! 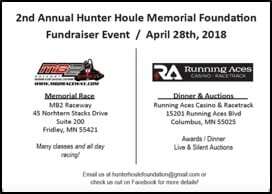 The 2nd annual event is kicking off on April 28th with a day of racing from 10 am to 6 pm at MB2 Raceway in Fridley, MN followed by live and silent auctions with a banquet style dinner at Running Aces in Columbus, MN. On behalf of the Hunter Houle Memorial Foundation, we are reaching out for your donations. 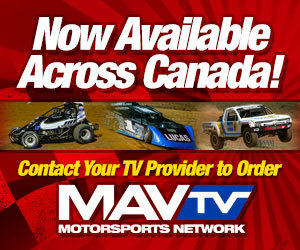 All donations are greatly appreciated and are tax deductible, subject to normal tax rules. The Hunter Houle Memorial Foundation is dedicated to helping those in need, the advancement of education, and engaging in other charitable purposes. The Foundation arose out of Hunter Houle’s true love of racing and strong passion for helping others. 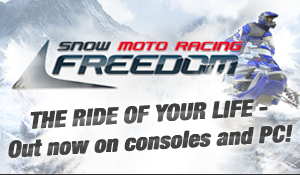 Combining these passions, the Foundation strives to benefit the community and those in need. Hunter was killed in a racing accident in 2016,while was preparing for a cross-country race in northern Minnesota. 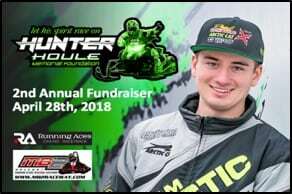 Following his tragic death, the racing community and the snowmobiling community in general came together to celebrate his life and pass on Hunter’s enthusiasm and always positive outlook through the Hunter Houle Memorial Foundation. We’d like to thank you in advance for your generosity and we look forward to seeing you at the Foundations’ Fundraising events! Please do not hesitate to reach out with questions at hunterhoulefoundation@gmail.com.